We get a lot of great feedback in the Portal, many containing anecdotes about the subjects of photos, postcards, and other images. 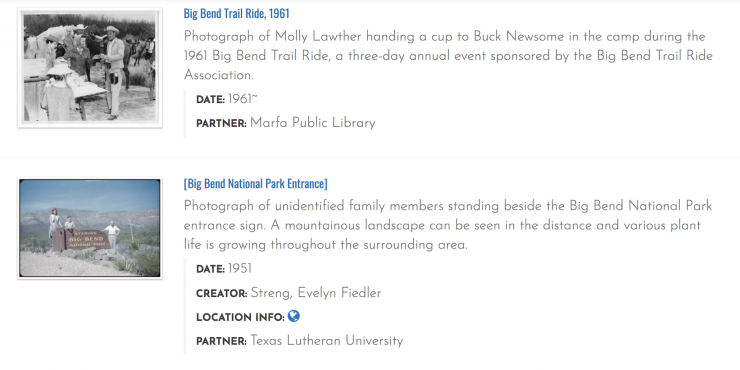 Oftentimes users recognize the location of an image on the Portal—be it a favorite childhood park, a mile marker passed on the daily commute, a shop downtown, or a farm belonging to some long distant relation. Sometimes places stand the test of time unchanged, become a bit weathered, or slowly fade into the background of a growing metropolis. More often than not, the subject of an image hasn’t existed for decades and the location lives on only in memory. 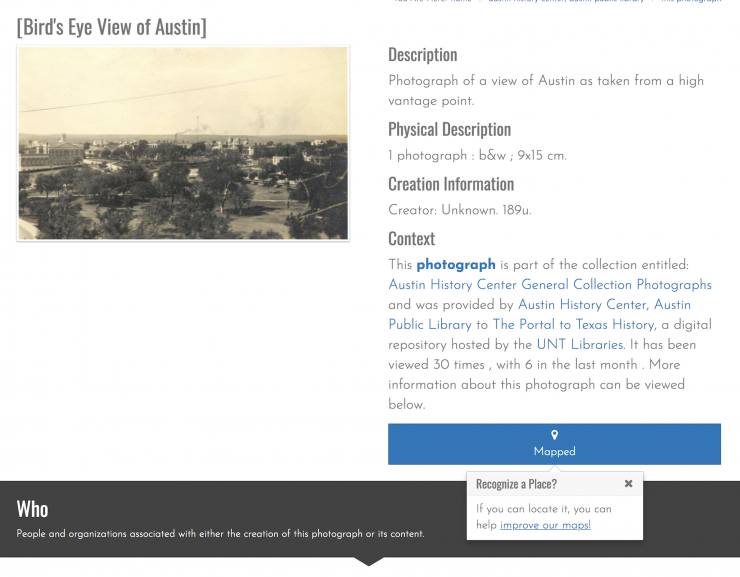 Of the 1 million + items in The Portal to Texas History, about 300,000 are historic photographs, maps, postcards, and videos and though we try, we aren’t always sure what exactly the subject is, or where it’s located. Through the hard work of our partners and staffers, we’ve been able to associate about 95% of our images with generalized geographic location names like counties and cities. But, when it comes to knowing exact locations, we fall short, having precise locations for only about 40% of these items. We’ve got plans for some exciting new mapping interfaces including ways to search and view items based on location, but in order to do so, and to make it as effective as possible, we need to improve our data, and we think you can help us bring that 40%, way, way up. How? Because you know your community’s history and geography best of all and we’ve built a tool that will easily let you share that knowledge with us. Location data in the Portal takes a few forms: place names, place points, and place boxes. For any location information we have about an item, we map it on a Google Map towards the bottom of an object’s ‘about’ page. A big blue “Mapped” button towards the top of an item’s overview page tells you if we have some kind of geographic information on that item. 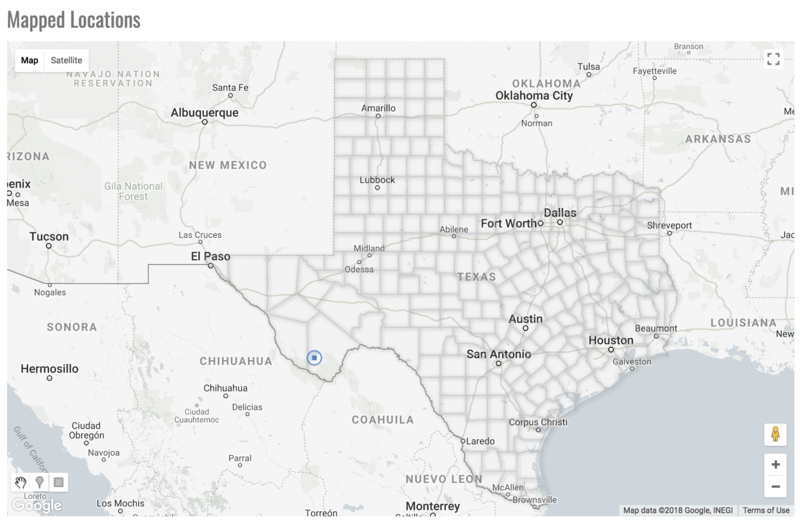 Place names are the most generalized type of geographic information we have, and look like: “United States – Texas – Tarrant County – Fort Worth” or “United States – Texas – Brewster County.” These locations are drawn from a large controlled list maintained in our system, and while many people could hazard a guess at where Fort Worth is, not everyone can locate a county, let alone towns like Marathon, Cushing, or so many other rural communities represented in the Portal. Figure 1. Map of Texas. Terlingua is marked. Place Points are markers on our maps that have been specifically pinpointed to a latitude/longitude by a staff person or volunteer and is the data we hope that you can help us with most because we are pretty sure a lot of you know where these things are, at least much better than we do. When we add place point markers to the Portal, we use an embedded Google Map in our editor to record data to six decimal points (ex 29.317652, -98.450081), which gives us a specificity for the object of less than a foot. In practice we don’t actually expect our data here to be that perfect, but place points obviously have their advantages, allowing us to update maps so that they reflect the real location of a place or structure. Similarly, place boxes are another way of indicating location data, but here in cases where the subject of the image is much broader. Typically we only use these on maps and aerial photos, and again, on the back end we have a tool that simply draws a square/rectangle onto a Google Map and we generate the coordinates from there. And now you can help us by adding them with simple drawing tools on the map we present on most all overview pages! Doing so is fun and pretty much a breeze if you know where something is, taking less than a minute if you know a location really well. Figure 2. Screenshot of Portal. Popover visible in lower-right corner. Similarly, if you are looking through search results or browsing a collection, you might notice some items have a small globe icon and others don’t. The globe indicates we know where the image is/was, its absence means we don’t. Figure 3. Search Results. One item has coordinates. Clicking “improve our maps” or scrolling through to the “where” section of a record will take you to the embedded google map at the bottom of the page. From there you can zoom in, pan around, switch to satellite view, or even street view in some cases to find the item on a map. Figure 4. View of new mapping tool with place point marker set. 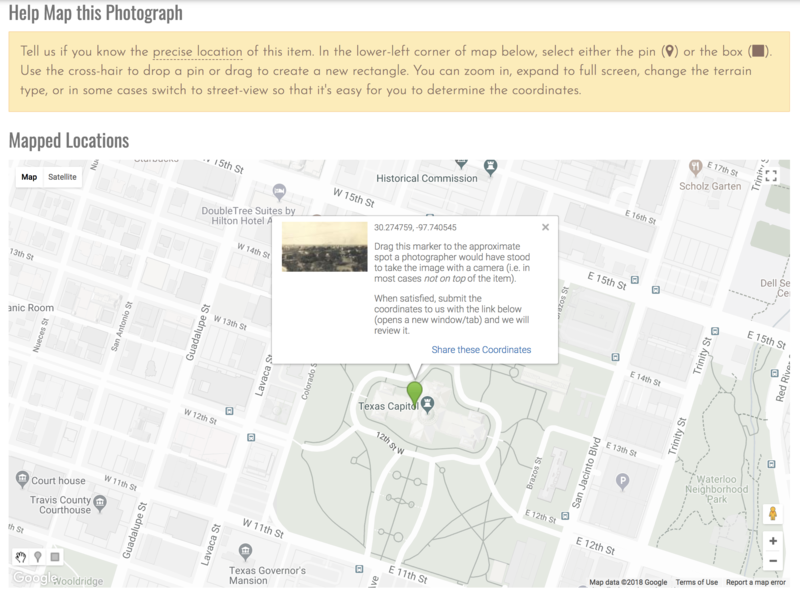 Once located, you can use the provided drawing tools (a marker and a rectangle in the lower left corner) and simply drop a pin or drag a box onto the map. The map will figure out the latitude and longitude for you and display helpful information in an info bubble. After dragging around a bit, if you are satisfied, you can submit your coordinates along with any additional context (how you know this info is helpful!) through our contact form. The Coordinates will be neatly copied and formatted for you in the form we need. After submission, we may take a bit of time to verify your coordinates, so don’t expect them to go up immediately, but we promise, your help is so greatly appreciated. Curious if this is really helpful? Here’s a building someone found photographed in the Portal and provided coordinates for. Here it is today. The building remains the same, but the city grew up around it. This structure was pointed out to be the same as this one, which today can be mapped to about here (the structure would have been where the ‘PowerHouse Spring’ building now stands). This “Bird’s eye view of Austin” is a wonderful historical view of the state’s capital city; a user pointed out that it was probably taken from atop the Capitol building facing southwest, with The Governor’s Mansion and St. Mary’s Cathedral visible in the distance. Our original record included none of those details and will be updated significantly as a result of the submission. Posted April 3rd, 2018 by William Hicks & filed under Featured.